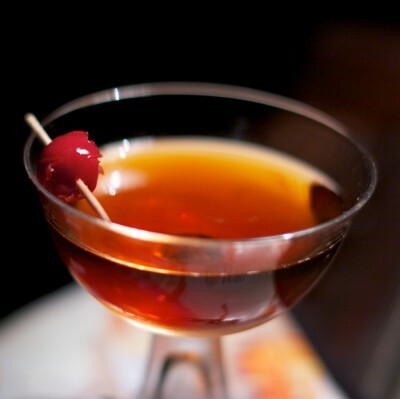 A Manhattan is typically two parts whiskey and one part sweet vermouth. It's fair to say that the vermouth is the dominant flavor. Instead of vermouth, the Red Hook calls for the complex and bitter Punt e Mes. Even at half the volume, Punt e Mes exerts its personality on the drink, but it is also transformed by the sweet, pungent flavors of maraschino. If you haven't yet added Luxardo to your cabinet you are missing one of the great liqueur flavors of classic mixology. The combination of this bitter substitution and the sweet liqueur fills any gaps left in the absence of vermouth. It's using the Manhattan formula and really taking it somewhere. Stir with ice, then strain into a chilled cocktail glass. Garnish with a cherry. Continuing our Manhattan comparison, for the base spirit you would have traditionally used rye whiskey. Rye's extra spiciness works well to poke through and stand up against the complex herbal flavors of vermouth. So too does rye meet the challenge in the Red Hook. Many recipes cite Rittenhouse 100 proof bonded rye as a good choice and we would have to agree, but we had no problems using Templeton—except that our supply is now dwindling. Could you substitute another whiskey? Probably, and there's no shame in doing so. Jamie Boudreau is even using white dog and aging the whole works in barrels. It's one more testament to the resilience of the Manhattan formula and to this variation. In the final assembly, this drink should be stirred. If you have ever shaken a Manhattan, shame on you. Ok, that's harsh, and your abuse doesn't affect the flavor, but you should take advantage of opportunities to preserve the clarity of an all-spirits recipe and showcase the gem-like quality by stirring. Shaking may cool a drink faster, but it will also introduce tiny bubbles resulting in an unattractive layer of foam on the surface and a cloudy appearance, not to mention tiny ice shards floating around. It may not matter with drinks that use citrus, but for our Red Hook, crack a few cubes and stir to chill. One of the reasons we love a recipe like this is because it starts out in familiar territory then takes you in a direction that is both interesting and delicious. It's also easy to make because you don't have to worry about fresh fruit or bitters. Punt e Mes isn't that difficult to find, and once you do, you won't have any trouble using it in substitutions and variations of other cocktails that call for vermouth. Luxardo Maraschino will lead you to plenty of other favorites too. As for the variations on this drink, several exploits include subbing Yellow Chartreuse for the maraschino. That's a good drink right there, but some will go further by swapping the Punt e Mes for a combination of Carpano Antica and Fernet Branca. Maybe we will have to explore those variations soon. In the mean time, Give the Red Hook a try. If you are a Manhattan lover, wander over the bridge and hang out with this variation for a while. You'll be happy you did! Also, try the the Greenpoint, and the Bensonhurst which are also Brooklyn variants and wonderful cocktails in their own right. Love this drink, and love the Greenpoint even more. Been mixing both lately with Pierre Ferrand as I've been on a cognac kick lately. Another great Red Hook variation is the Kirkwood from Leon's Full Service in Decatur, GA: 1.5oz rye, 0.5oz each Punt e Mes, Cynar and St Germain, grapefruit bitters (housemade at Leon's) and grapefruit twist, stirred and served up. You featured the Edgewood a few weeks backs, Kirkwood is just one neighborhood over! I tried the Greenpoint yesterday and was surprised how well everything came together. I'll defintely be making the Kirkwood! Thanks for posting it! I made the Greenpoint last night and like you, was very surprised at how seamless the drink was. I did register a full sweetness in the drink so I'd be interested in making a Red Hook to compare. The Greenpoint, which I made with Templeton, was very drinkable and probably a little dangerous because of that. Thanks for all of the great information! I'll run and grab a bottle of Punt e Mes after work today. The races are on Saturday, March 29, but cyclists from around the world will be flocking to Red hook this week to get a look at the course.